Hello, super amazing Love Posse! I’m sending love and a hug and checking in about my upcoming course. We begin next Monday and will be meeting online for 8 weeks. In that time we’ll study some of the A Course in Miracles workbook lessons and apply them to our real issues in our lives. Everybody has real issues, and if you’re interested in the Course and you enjoy my style of sharing light, you might consider joining us. 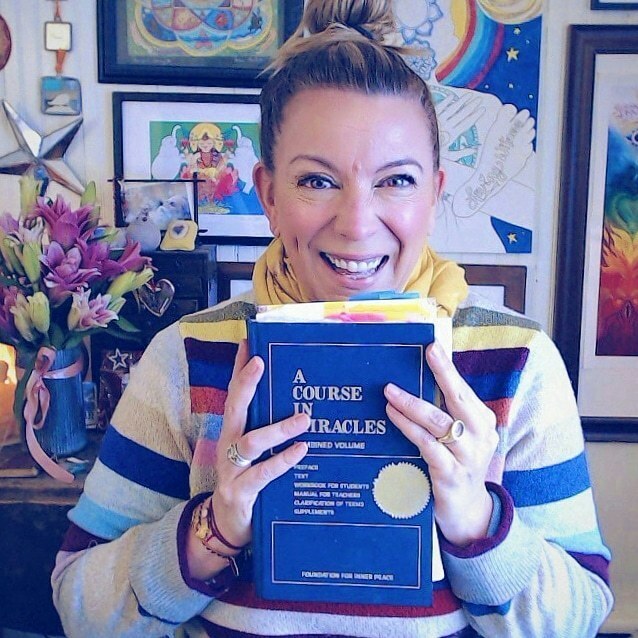 We will be studying the lessons in the ACIM workbook. This round we begin on lesson 70. It isn’t necessary that you’ve done the previous ones. We start where we are. Each week will begin with an email musing from me — a gentle love letter with my own stories and prompts for your inquiry and reflection. The weekly email will include the recording links for the lessons we are studying that week. I’ll read the day’s lesson, we’ll do the assigned practice together, and then I’ll share some gentle prompts with you. These will be .mp3 audio files you can take on the go, listen to in bed, or head out to the gardens with a nice cuppa and receive. You will need around 10-15 minutes per lesson. I share audio files on Dropbox. We’ll have a private Facebook group. This will be our space to meet up and discuss what we find. A spot to share and receive. Each Friday at 12:30 pm Central Daylight Time, I’ll host a lunchtime live in our private group so we can discuss the week’s lessons and I’ll offer a healing and answer your questions. It’s okay if you can’t make the calls live, I will provide you with a copy of the recording and I will always offer you a chance to submit a question ahead of time too. Yes, you can still do the course and not be on Facebook. All recordings and course materials will be provided to you. I am not an expert. I am a human heart, just like you. I have real world crap that happens and I struggle, just like you. I am all in for love and healing and I want to see us shining. I came to the Course because I knew it would help. Knew it in my bones. My life was feeling like a repetitive pattern of same upset, different day and I wanted out. Have you had those spiritual practices you tried for a while and then they just fell off? And you were like, wait where did the magic go? Yes, I have had lots of those too. But somehow, the Course just stuck. We begin on Monday, Feb 11 and we’ll travel together for 8 weeks.